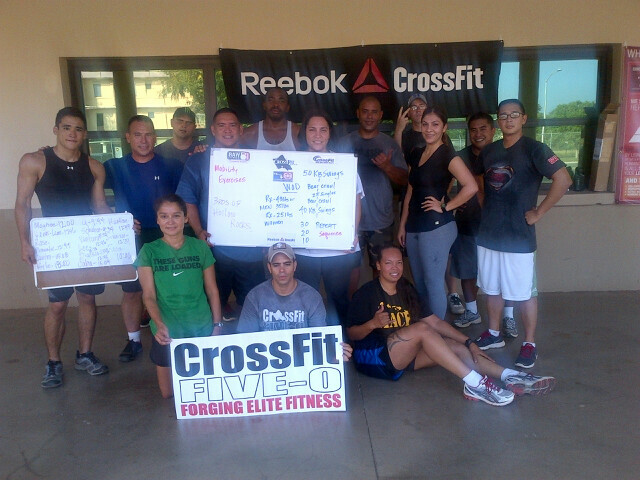 CrossFit Five-O is a core strength and conditioning program. We strive to develop our athletes to become stronger in both mind and body. Our program is available to all Military members, their spouses, DOD civilians, Military Technicians, State Technicians and Civilians. We follow CrossFit’s prescription of fitness incorporating functional movements, that are constantly varied and executed at a high intensity. CrossFit will prepare you for the unknown and the unknowable, and will develop each athlete in the 10 general physical skills. Always an awesome workout — traditional workouts takes on a whole new meaning! I am thinking that more is better, just like the children’s commercial. Maybe we could meet on Wednesdays too. To my coaches thank you and please yell at me more like a drill SGT, it is very motivating to me.